Almost everything :-) Lack of utilities is made up for by helpfulness of owner to facilitate, ie: use of washing machine in vacant apartment if there is an empty one. The location is fantastic, if like me you like quiet, remote & peaceful. Beware though, a taxi is required a lot!! Miguel is very helpful & Sandra couldn't be more pleasant & helpful, what a lovely lady. We did not have linen changed at all whilst we were there and also could not get in touch with the person who met us there first day after that day. We have not had our breakage deposit returned even though we only broke two glasses. The position was not too far to playa del Ingles, the pool was clean and beautiful. The price was ok and the cleaner was excellent, really nice person, gentle and tidy. The area was really quiet, not much traffic. The swimming pool was clean and nice. The apartments were also clean and good for 5 people. Bungalows Las Almenas This rating is a reflection of how the property compares to the industry standard when it comes to price, facilities and services available. It's based on a self-evaluation by the property. Use this rating to help choose your stay! 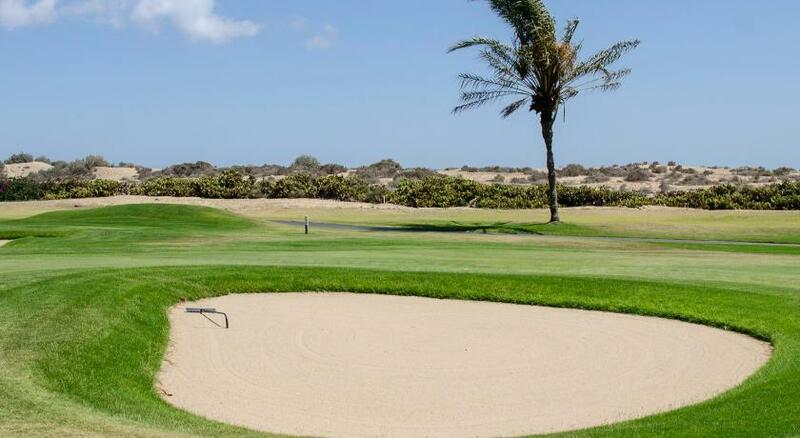 Set next to Maspalomas Golf Course and its shopping center, Bungalows Las Almenas offers well-equipped bungalows with private terraces. The complex features an outdoor swimming pool set in gardens. Each spacious bungalow at Las Almenas has simple, colorful décor. The living room has a sofa bed and a flat-screen TV with European satellite channels, while the kitchen comes with a microwave, fridge, electric hob, a toaster, an electric kettle, coffee maker. You can dine on the terrace, which looks onto the pool and gardens. There is a supermarket nearby, while bars, cafés and restaurants can be found in the center of Maspalomas, approximately 1.2 mi away. The nearest beaches and Maspalomas’ famous sand dunes can be reached in just 5 minutes by car. Meloneras beaches and its golf course are less than 2.5 mi away. Wi-Fi is available at an extra cost. When would you like to stay at Bungalows Las Almenas? Offering pool and garden views from its terrace, this spacious bungalow has simple, colorful décor. There is a twin bedroom, and a living room with a sofa bed and a TV. The kitchen comes with a microwave, fridge, electric hob, a toaster and coffee maker. You can dine on the terrace, which looks onto the pool and gardens. Bungalows are cleaned twice a week and bed linen is changed weekly. Offering pool and garden views from its terrace, this spacious bungalow has simple, colorful décor. There are 2 twin bedrooms, and a living room with a sofa bed and a TV. Bungalows are cleaned twice a week and bed linen is changed once a week and towels are changed twice a week. House Rules Bungalows Las Almenas takes special requests – add in the next step! A damage deposit of EUR 100 is required on arrival. That's about 113.02USD. This will be collected as a cash payment. You should be reimbursed within 7 days of check-out. Your deposit will be refunded in full by bank transfer, subject to an inspection of the property. Please inform Bungalows Las Almenas of your expected arrival time in advance. You can use the Special Requests box when booking, or contact the property directly using the contact details in your confirmation. There's one minor issue - cash only payment and a security deposit. I tend to go to the Gran Canaria 2/3 times a year for the last 20 years, I'd say it was 12 years ago when I was last asked for a deposit - in cash!!! The deposit is not refunded at the property either - you've to email afterwards with your details - really not great in 2018!!! Noise, the walls are thin so I could here everything in the other three apartment, number one had three guest that where party animals . As much as we love it here, for the price, it really could do with a washing machine & an oven. Other places have these at less cost & they are essentials for a longer trip, which we usually take. See below. Although the accommodation is in line with the area pricewise, it is slightly expensive for what it is. That said, it is our second stay there purely because I love the location. A big negative however was the washing machine had been removed from the bungalow....... big big disappointment when you have bought clothes based on a 3 week stay WITH A WASHING MACHINE. We were fortunate enough to have the use of a machine for a few days, but with no laundry service nearby and the cost of the stay, a washing machine would be expected. There is no oven either but we could manage without that. In all, as much as we love the property, I will have to check price wise if it is worth it or not when I return, I will be shopping around more before September. There was a leak in the bathroom and the television did not work. There wasn't WiFi included with the price, which sounds really strange to be honest in 2018. There wasn't the washing machine which is really important if you travelling for a week like us. The apartment is located in the area which is really hard to find for taxi drivers. 4 out of 5 taxi drivers did not know where it was located and the 5th taxi driver only found it with a second attempt. The owner did not meet us next to bungalows and we had to find a person that can speak Spanish so he could explain the reception that we don't know where is the bungalow. The cleaner only came once, although we were there for 6 days. Be prepared to buy toilet paper and plastic bags for garbage yourself. There was some kind of a problem with electricity and we didn't have it for 3 days. When we called the reception they said that they can't do anything because the owner is asleep as the electricity switched off in the evening but they seemed not to care about the fact that we were staying with small children. Also all the food that we bought before was ruined. The next day electricity was working for about 3 hours and it was switched off again. This time the owner said that "we should understand". He did not offer us another place to live or any compensation. Only for a third day which was our last day he offered us a bungalow but didn't event bother to come to our bungalow and say a simple "sorry". Also if you want to go to the beach you will have to take a taxi or rent a car.